NOTE: The following interview will appear in the May issue of The Good Life. Enjoy! Winston-Salem, NC - For many local residents, spring brings with it some familiar chores that must get done around the house. You know… the dreaded "Spring Cleaning." But what if you could start your spring cleaning… and CASH IN?? Recently I had a chance to catch up with Tracy Myers, owner of Frank Myers Auto Maxx who has created a very unique way for my readers to really profit from the necessary evil of spring cleaning. "Last weekend I was out doing the ‘dirty deed’ and I uncovered some old junk laying around the house that I wanted to get rid of and it got me thinking… I bet lots of people have stuff hanging around the house that they’re thinking about getting rid of… maybe should have gotten rid of a long time ago or are going to pitch when they do spring cleaning," joked Myers. But Myers was only half kidding. He's one of the few local businesses that has continually marketed his business even during tough times and works hard to come up with fun and exciting ways to deliver value and solve problems for people every month. This month is no different. His latest innovation is the Spring Cleaning Trade In Event which gives all Winston-Salem residents an opportunity to get rid of their old stuff and get money for it. This money is used as a discount on any nicer, newer Certified car from Frank Myers Auto Maxx. Tracy's inner salesman came out when he told me, "So here’s the deal: you can bring in anything… and I mean anything and I'll trade for it. So get to your Spring Cleaning Right Now because it means found money for you during my Spring Cleaning Trade In Event." I guess you could say that your junk has never been worth more as long as Myers is around. Whatever you've got… Myers says, "I want it." CDs, DVDs, old cell phones, video game systems, sporting equipment, furniture, household items, lawn equipment, guns, antiques, power tools, boats, motorcycles, your old car and whatever else you can trot, tug or tow down here. Myers quipped, "Keep you kids and your pets. I'll take anything… as long as it's legal and doesn't eat." The Spring Cleaning Trade In Event at Frank Myers Auto Maxx will even feature an antique appraiser who can tell you what some of your older stuff might be worth. Myers told me it's going to be like the "Antique Road Show" but not everything has to be worth something for you to get money for it. On top of all this, regardless of the value of your junk, just for playing along, when you drive home in a nicer, newer vehicle from Frank Myers Auto Maxx, they will pay a guaranteed $1,000 for your junk. Can you imagine turning all your old junk into a whopping one thousand dollars (or more…)? I guess one man's trash really is another man's treasure. "My EVERYBODY RIDES program is designed specifically to help people who have been through tough situations in the past that have kept them from being able to get a nicer, newer vehicle. My program is like Mr. Clean for your credit -- yeah, the bald, muscular guy in the white t-shirt." 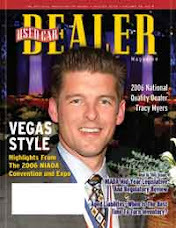 Myers says he can do the deals that other dealers can't because his process is centered around finding the bank that best matches your scenario… instead of just depending on a yes or no from a single bank. His EVERYBODY RIDES Program as he calls it, also puts the person back into the financing equation, not just the past credit history. Myers believes this is what makes his program different and gives local residents the best possible chance of being approved anywhere… PERIOD. "If Your Junk Is Valuable… Think What Your Old Car Could Be Worth," Myers told me, almost getting giddy about it. "I already told you during this special event I'll trade for anything. That's right anything LEGAL! But if I'm willing to trade you for your junk… imagine what your old car could be worth. There will never be a better time to get the most money for your trade. Whether it's junk or not so bad, I'll take it off your hands this week and give you some real $$$ for it," added Myers. But don't wait long. In one of the few serious moments during our conversation, Myers told me that he was only going to be holding this Spring Cleaning Trade In Event until May 31st. "If you snooze you lose," Myers stated. "So, start your spring cleaning right away and cash in. Bring me your stuff and I'll trade for it." Visit Frank Myers Auto Maxx at 4200 North Patterson Avenue in Winston-Salem or call 336-767-3432 to make an appointment to have your stuff or your current vehicle appraised.